Susan's Blog for sharing her passion for great food! My croissants after using my new proofer! It's always been a challenge proofing (the final rise before baking) home made croissants. The butter that is encased in the dough will melt if the croissants get too warm (above 90F). Unfortunately, in my cool kitchen, the croissants take forever to rise and can get dried out during the process even when covered. Also, a cold croissant, even if proofed sufficiently, may not get as good an oven rise as one that is 80-90 F throughout. In a commercial setting, bakers have a proofing cabinet available to keep humidity and temperature under control. I have tried for years to come up with a home solution that was inexpensive, easy to use and not too risky (like using my oven as a proof box). Today, I was quite excited to have come up with the best solution so far. I tried two different containers for my proof box; a 28 quart Sterilite bin with a cover and a metal chafing pan with a domed lid. They both worked fine, but the plastic container is larger, lighter and cheaper, so that's the one I'm going to show you. I placed it on a hot pad, put a half sheet pan inside and filled the pan with about a half of an inch of hot water. 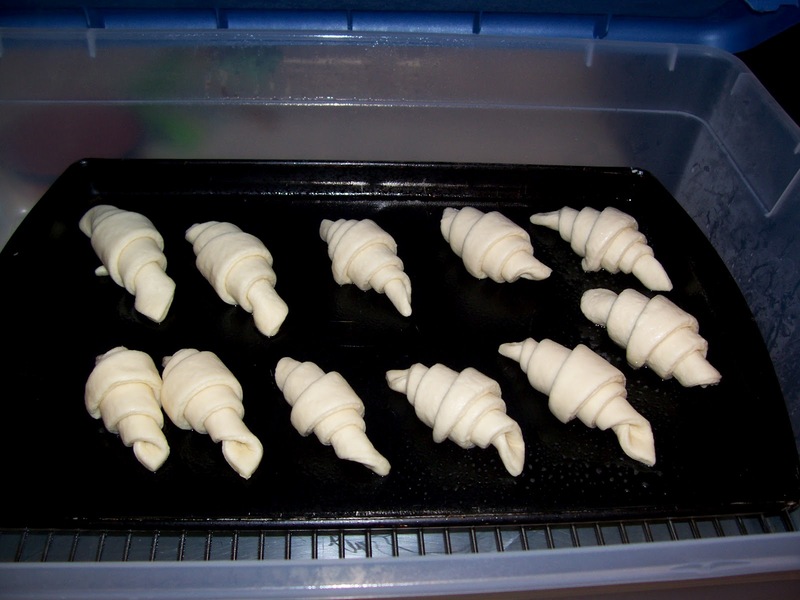 Then I placed a baking rack over the water on the sheet pan and put my tray of croissants on the rack to proof. Then the lid went on and about 30 minutes later the croissants were ready to be baked! The temperature was monitored with a probe thermometer. I used boiling water, which made the proofing environment at little too hot at first, but after a while it cooled down enough so that the butter was safe from melting. Even thought the temperature was too warm, the croissants rose and were ready for baking, before the butter had a chance to melt. I suppose the internal temperature of the croissant was not as high as the ambient temperature of the bin. I was quite happy with the results - The proofing time was short and the croissants stayed intact and baked beautifully! Croissants proofing on a rack over hot water in a pan in a plastic bin. Before egg glaze and baking. Thermometer showing that the temperature was a little too warm at first. Between 90-95 would be best. For more info on making croissants, please check out the video above and/or my croissant recipe page. Happy baking! I have been wanting to bake my own croissants and breads at home, but did not know what I was going to do about a proofing box until I happened across your blog. Thank you for posting this information I plan to try this. No Pizza Stone? No Problem! How long does it take for the dough to rise? Plum Sauce -Fresh, Delicious and Easy!